Sycamore UK Ltd is the UK market leading industrial wipes specialist - we research, develop, manufacture and distribute a dermatologically tested range of specialist cleaning wipes worldwide under our hugely successful BIG WIPES™ brand. 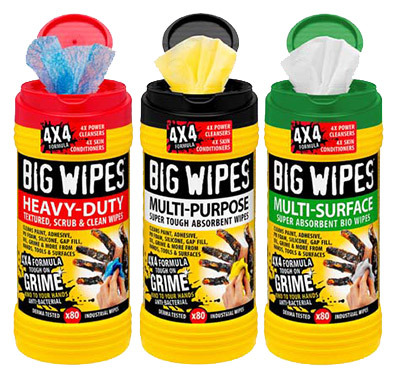 In 2014 the best got even better: Big Wipes has launched its all new preservative - free antibacterial 4x4 range of industrial strength wipes, containing no fewer than four powerful cleaning agents and four of the best skin conditioners, making Big Wipes 4x4 cleaning wipes even tougher on grime and even kinder to your hands. 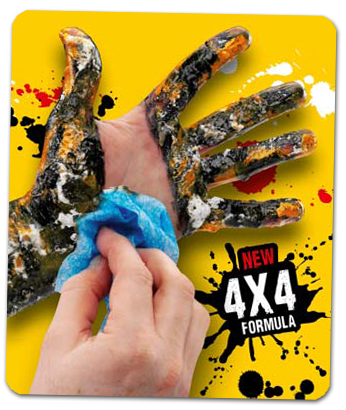 - 4x Power Cleansers – tackle paint, adhesives, oil & sealants, silicone, PU foam, grease & grime quickly and easily. - 4x Skin Conditioners: Aloe Vera, Glycerine, Lanolin & Vitamin E – help to protect, nourish and moisturise the skin. - Dermatologically tested and assessed to the latest EU Regulation 12232009 for cosmetic products – zero levels of skin irritation recorded. A tradesperson’s hands are their most valuable assets……you can buy all the fancy power tools in the world but you only get one set of hands to work with, so you’d better look after them. Paint and varnishes, sealants, silicones, adhesives and PU foam simply don't come off with soap and water.